MU senior Ryan Bee (91) sacks UNCC quarterback Evan Shirreffs, during the second half of Marshall’s 17-point victory on Saturday at Joan C. Edwards Stadium in Huntington, W.Va.
HUNTINGTON, W.Va. — The stampede started as the sun went down. Two minutes into the second half of Saturday afternoon’s Conference USA football game at Joan C. Edwards Stadium, Marshall and visiting Charlotte were tied at 13. 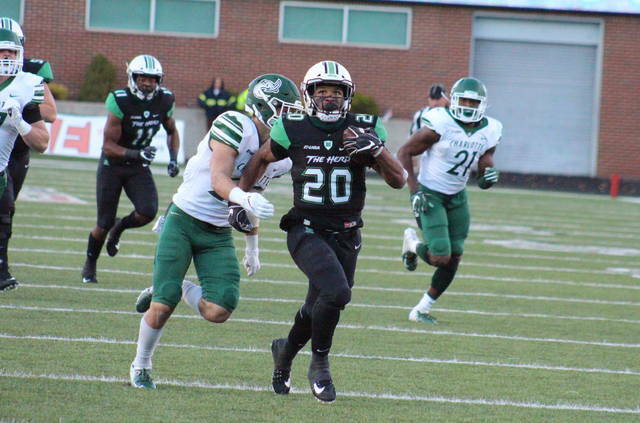 However, the Thundering Herd scored 17 unanswered points to take a 30-13 victory, becoming bowl eligible for a second straight season and the sixth time in head coach Doc Holliday’s tenure. 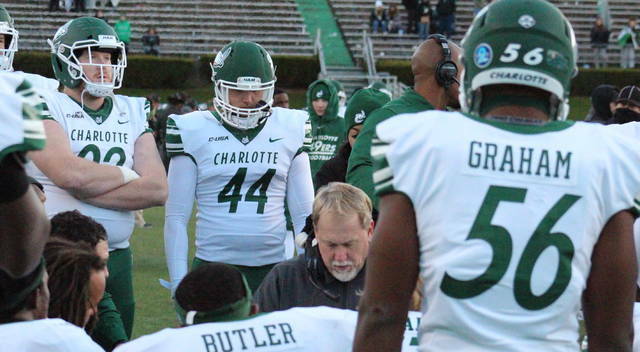 Charlotte (4-6, 3-3 CUSA) —which is now 0-5 on the road this fall — found the end zone first, but never again, going 75 yards in 12 plays with quarterback Evan Shirreffs sneaking across the goal line from one-yard out. Jonathan Cruz made the point-after kick to give the guests a 7-0 lead with 8:42 left in the first. 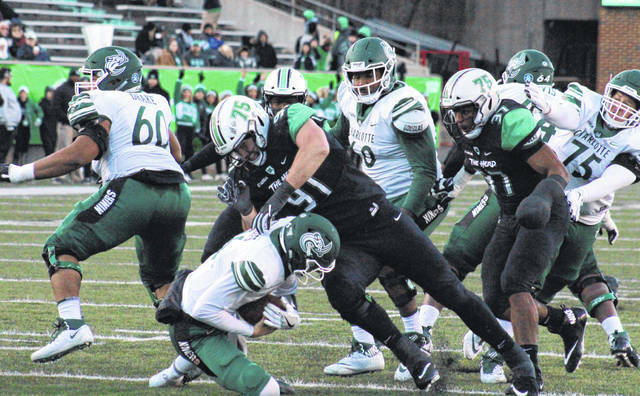 Marshall (6-3, 4-2) —which improves to 3-1 against UNCC all-time meetings —covered 59 yards in 11 plays on its first offensive possession, but settled for a 23-yard Justin Rohrwasser field goal. The Herd defense forced the game’s first three-and-out on the ensuing drive, and redshirt freshmen Darius Hodge blocked the punt. Fellow MU redshirt freshman Naquan Renalds recovered the blocked punt just one yard from the end zone. Marshall took a 10-7 lead on the very next play, as Anthony Anderson plunged into the end zone and Rohrwasser made his first of three extra point kicks. Charlotte was forced to punt on its next three possessions, never advancing past its own 40. Marshall was forced two punt in back-to-back drives, but made its lead 13-7 with 4:21 left in the half, as Rohrwasser made a 33-yard field goal to cap off a seven-play, 48-yard possession. The 49ers got those three points back on the final play of the first half, as Cruz made a 40-yard field goal at the end of an 11-play, 47-yard drive. 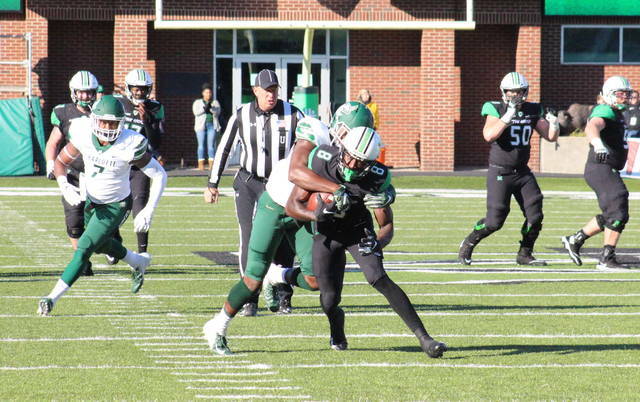 Marshall received the second half kickoff, but fumbled the ball on its first play from scrimmage, with Ed Rolle stripping the ball and Timmy Horne recovering for the guests. Charlotte gained just two yards in three plays and tied the game at 13 with 13:48 to play, as Cruz nailed a 35-yard field goal. Marshall reestablished its lead on the following drive, going 75 yards in 12 plays and 3:49, with redshirt freshman Brenden Knox scoring on a four-yard run. The MU defense forced its first of five second half punts and four second half three-and-outs on Charlotte’s next drive. The hosts settled for a 23-yard Rohrwasser field goal with 4:39 left in the third, but made its lead 30-13 with 4:02 later, as Isaiah Green tossed a 10-yard scoring pass to Obi Obialo. Both teams punted twice in the scoreless fourth quarter, and Holliday was pleased with how his team responded to the 49ers physicality following the victory. Marshall committed the game’s only turnover, but MU is 6-0 when this season when the turnover margin is minus-1-or-better, and 0-3 when it’s minus-2-or-worse. MU claimed a 16-to-13 advantage in first downs, converting 8-of-15 third downs, while Charlotte was 5-of-16 on third down tries. 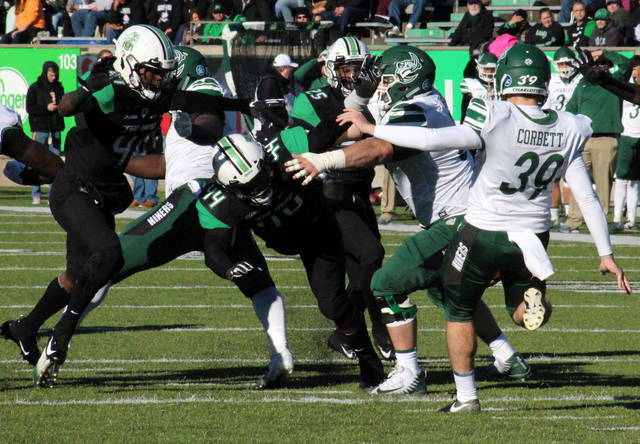 Marshall outgained its guest by a 325-to-185 count in total offense, including 147-to-113 on the ground. The Thundering Herd picked up 3.9 yards per carry, while holding Charlotte to 2.8 yards per rush. For the hosts, Green completed 15-of-25 pass attempts for 178 yards and a touchdown, while adding six yards on a pair of carries. Knox became the first rusher to hit triple digits against the 49er defense this season, posting 116 yards and a score on 22 tries, while catching two passes for 16 yards. Anderson had 29 yards and one score on 12 carries, while catching one six-yard pass. Tyre Brady led the MU receiving unit with 95 yards on six catches. Artie Henry posted a career-best four receptions for 43 yards, Obialo had one 10-yard touchdown grab, while Marcel Williams caught one six-yard pass and Armani Levias grabbed one two-yard pass. Leading the Herd defense, Frankie Hernandez had career-highs of 11 tackles and 1.5 sacks, with a game-best 2.5 tackles for a loss. Ryan Bee also had 1.5 sacks in the win, giving him 18.5 for his career, 10th most in MU history. Malik Gant had two sacks for Marshall, while Marquis Couch and Brandon Drayton each had one. For UNCC, Shirreffs was 8-of-18 passing for 74 yards. Benny Lemay led the rushing attack with 70 yards on 13 tries, while Rico Arnold paced the team’s pass catchers with four grabs for 49 yards. Marshall is back on its home field at 2:30 on Saturday, as it hosts UTSA.